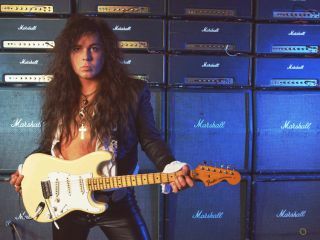 Yngwie Malmsteen is a Swedish metal guitarist most noted for his fluent technique and neo-classical metal compositions. He's released countless albums and, although he enjoyed his most commercial success in the '80s, he was picked by Joe Satriani for the G3 tour line-up in 2003. As well as a now-discontinued Gray YJM308 signature overdrive pedal (named after his initials and his favourite car, the Ferrari 308), the Fender Custom Shop are recreating Yngwie's 1972 'Duck' Stratocaster. High honours indeed. Right now, Malmsteen and his group Rising Force are preparing for next month's release of self-produced and self-engineered album Perpetual Flame. It marks the first new material since 2005's Unleash The Fury and the first featuring ex-Judas Priest frontman Tim 'Ripper' Owens. Yngwie's taking time out from his busy schedule to talk to MusicRadar next week and this is your chance to ask the questions. Simply add one to the comments below (you'll have to be registered and logged in to do so). We'll pick the best and ask them during the interview.